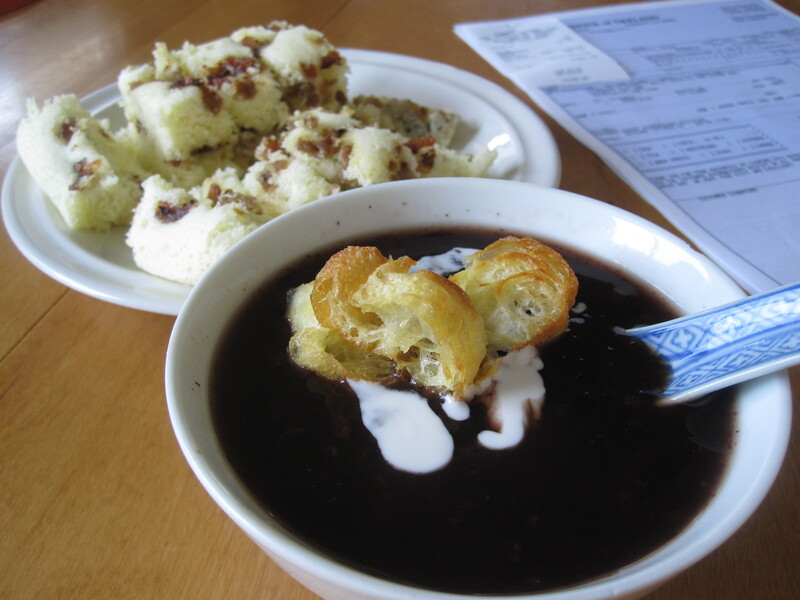 Pulut hitam, like BoBo ChaCha, is one of the classic Malaysian dessert soups. I have been wanting to make this dessert soup for awhile but just never get to it. It’s a good change to the regular red bean soup at our house. Too bad my children are not big fans of it, so I ended up giving 2/3 of the soup to friends. It was a very delicious dessert soup nonetheless. I especially love the crunchiness of Chinese donuts with the soup… Mmm, so heavenly! 4 pandan leaves– tie a knot. See note below. Combine both rices and rinse a couple of times. Soak in plenty of water 2-3 hours or overnight. Drain. Add 6 cups of water,drained rice and pandan leaves in a deep pot and bring to boil. Turn heat to medium and cook until the rice broth is silky smooth to the taste and rice is tender and yet yields texture to the bite. Keep stirring during cooking to prevent rice sticking to the bottom. While the rice is cooking, boil remaining 1 cup of water with gula melaka and rock sugar in a small pot, until sugar dissolves. Strain to remove impurities. Add to the rice soup/pulut hitam (add more water to rice soup if it’s getting too thick). Prepare coconut sauce: put coconut milk and salt in a saucepan and boil over low heat until it bubbles. Set aside to cool. To serve, scoop pulut hitam into a bowl. Drizzle with some coconut sauce and top with Chinese donut pieces. Adding white gluten rice is to make the soup more silky taste. 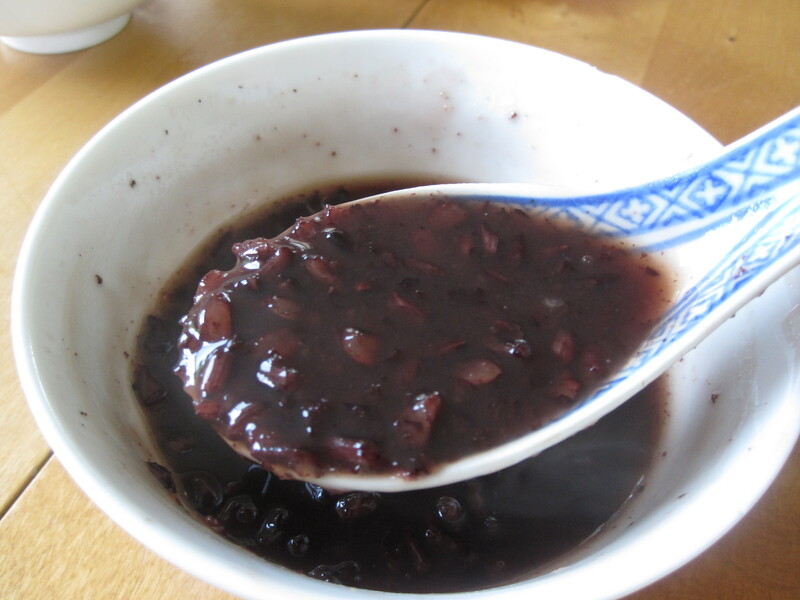 You can do the same with other dessert soups too like red bean soup. Frozen pandan leaves have lost much of its fragrance so double or triple the amount calls for in the recipe. Pandan leaves give the soup a fragrant aroma. Omit it if you can’t find this ingredient.